Enjoy the warm weather and festivities at the club this July! Summer is officially underway. Members please note that the gas dock is now open! Gas, Diesel, and pumpouts are available for all members, guests, and friends! The event includes a chase race from the KYC clubhouse to our Wolfe Island property, followed by a BBQ by Chef Neil and assorted festivities. The Orange Peel will be making the trip on Saturday and can take several members there (departing the club gas dock shortly after 11:30 am) and back (departing Jemmett's Landing early evening and arriving back at the club an hour later). For race details please refer to the "Sailors Handbook". Please sign up with Greg so we can plan food accordingly. 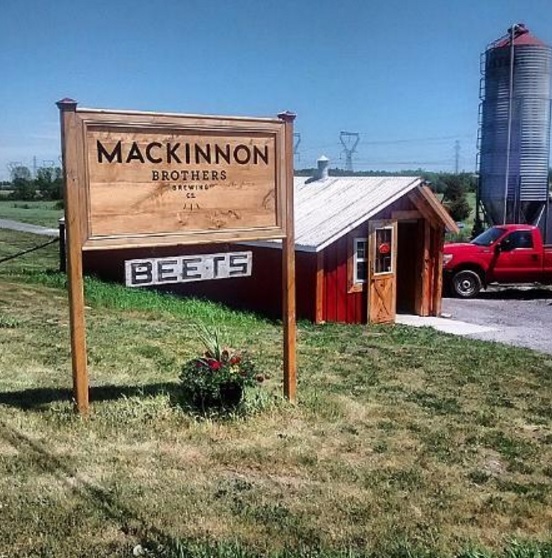 Please Join us for our Mackinnon Brothers Brewery Tour and Lunch on Sunday, August 6th! Our Plan is to Sail / Drive to the Bath Docks for 11.30am. From there we will enjoy a Hay Wagon Ride to their facility. The plan is to tour the plant and enjoy a great lunch from Chef Neil (who will also be sailing over on his boat). The cost is $30p.p. for the tour and lunch. To sign up, or for more details, please contact Greg manager@kingstonyachtclub.ca or by phone 613.548.3052 by Aug 2nd. There’s lots to do in the Picton area – so it’s not just about the jazz. To begin with, we will hold our traditional BYO dinner on Friday night at Miss Lily’s Café. Show tickets at the Regent are $42 each and the pre-show dinner is expected to be about $30 all in! (more on the dinner later). You are welcome to participate in one or both events. Jazz concert tickets for August 18th should be reserved right now through the club, by contacting the office at KYC (613-548-3052) or emailing manager@kingstonyachtclub.ca - Tickets will be charged to your club account and John Kitney will get these to you before the event. Harbour mooring will also be arranged for those who are interested, along with a second evening outing on Saturday night still in the works (perhaps another Festival Players live theatre production like we did last year). Please let John know that you have ordered your jazz concert tickets (kitneyj@kingston.net) so that he can survey participants for interest in the other weekend activities. Women in Wind will continue to meet every Wednesday evening in the spring after yoga with Norah 4-5pm. Join us for social time directly after yoga for drinks, dinner etc. What to Bring: Mat, comfortable clothes & H2O (A mat can be arranged in advance if you need, please contact Norah for this and with any questions pertaining to what will be covered in class). We are finishing up an amazing first session here at Junior Sailing! Even with the high water and strange wind, the sailors have done an amazing job and learned many new skills. We have enjoyed Pizza Day, Feeding Frenzy, and guest coaching from Dannie Boyd and Chris Cowan over the past two weeks. We are excited for the rest of the season and there are still spaces available for sailors register later in the summer! 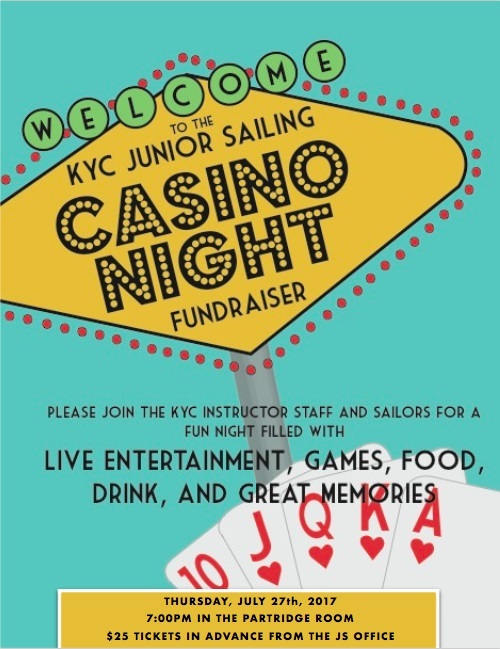 We are excited to announce that the Junior Sailing instructor staff will be hosting our Casino Night Fundraiser again this year! Taking place on Thursday, July 27, 2017, at 7:00pm, family, friends, sailors and community members are invited down to play Black Jack, Roulette and Texas Hold'Em as well as enjoy food, drinks, and great company! Tickets are $25, available at the Junior Sailing office or at the door. All proceeds will be going towards the JS program and we hope to see you there! Dinghy Race Night continues this coming Monday. Meet at KYC at 5:00pm to rig for a 5:30 skippers meeting and 6:00pm first race. We look forward to fun races with Coach James, Coach Grace and the other JS Coaches! This season has seen a few changes at the club, some planned and some not planned (high water builds for instance). One such new and welcomed change was harbour expansion. This planned project has given new excitement to our club with shiny new finger docks, new boats and new members. With changes to design, sometime there is a need to change existing facilities to make the harbour safer for keel boats to enter and exit the harbour. To do this, part of our beloved T-dock was modified to what we now collectively call the L-dock. Still in the same location this modified dock has less of a footprint for users. The good side of this was new decking that looks great and is much safer. Getting back to the footprint, one would only have to reach back to remember the summer of 2016 to recall how very popular the T-dock was to many user groups. Congestion, especially in the hotter days was common. But true to the KYC community, we all shared the asset and helped keep the congestion down when and where we could. 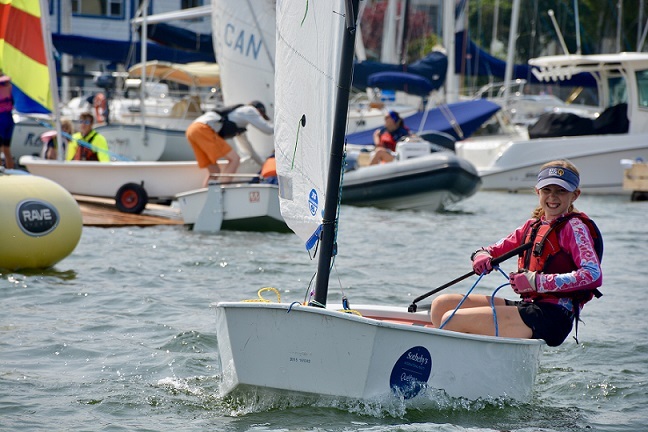 The Junior sailing program under the learn to sail portfolio is one such user group. During the high season (July-Aug), we heavily use this precious resource Monday to Friday for dinghy launch, noon docking and swimming. With this decrease of footprint, we have collectively planned to reduce traffic when and where we can. The new JS staff are aware of the issue and are doing their best to keep traffic flowing in a directed and safe manner. We will try our collective best to ensure we all have access to the dock, but must ensure the program is run efficiently and safe. Our only “ask” from the membership proper is to understand our needs at certain times of the day. We don’t intend to take over this special resource, we only ask that members understand that we have a program to run and some time slots will be busier that others. Noon time is especially busy, with morning launch and end day haul out also very busy. We ask for patience and understanding during these high traffic times. Any issues or needs to communicate concerns should be brought to the sailing manager James Rountree or the Head Instructor Grace Whiteside. 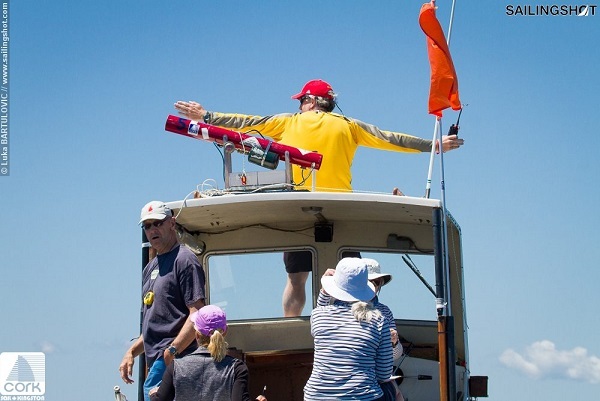 The Main Duck Island race was completed last Saturday with 5 starters: Ramble On (skipper Chris Walmsley) returned before rounding Amherst Island due to light/no wind. Force 10 (skipper Bob Crowson) returned after charting previously unknown territory. The finishers were 1st Breakaway J (Hugh McGugan), 2nd Farr 30 (skippers Mike Hull, Dave Wilby, Don Ruddy) and 3rd Ritalin. As an added bonus, we received video evidence supporting an anticipated nomination for the Cameron Rock special award! The PHRF 1 and PHRF 2 fleets continue their June-July Tuesday and June-July Thursday series racing. The Sharks have started their July series. 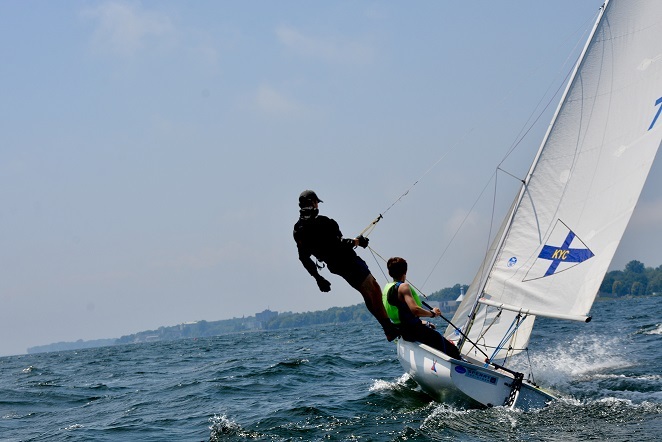 Last weekend, KYC hosted the Viper 640 Canadian Championships. With 8 competitors, racing was held over 2 days of contrasting winds (light winds on Saturday and heavy breeze on Sunday). Thanks to the volunteers from KYC and CBYC for running this regatta and KYC staff for an excellent BBQ. Next year, KYC will be co-hosting the Viper North Americans with CORK. This weekend, several boats from KYC are competing at EYC 2017 regatta in Oswego, NY. One was denied entry into the USA! This event was moved from Henderson Harbour due to high water. KYC is the host for EYC 2018 regatta next year. 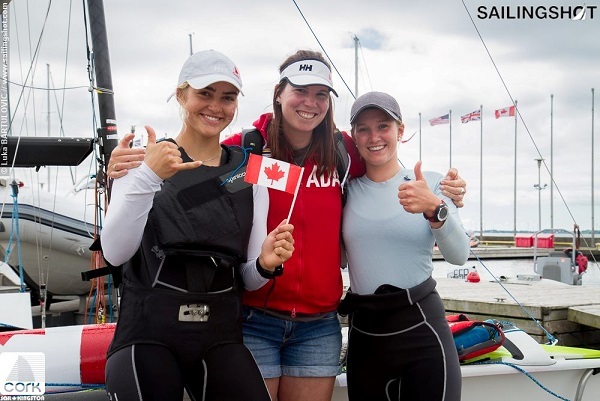 Several KYC Sharkies will be racing next week in the Shark Worlds in Toronto at RCYC. Go team KYC! The championships kicked off at KYC with the help of the Town Crier, Arielle Morgan as MC and Commodore/Race Officer Ross Cameron. Athletes, coaches, volunteers and families enjoyed the food and drinks on the newest patio area at the club. 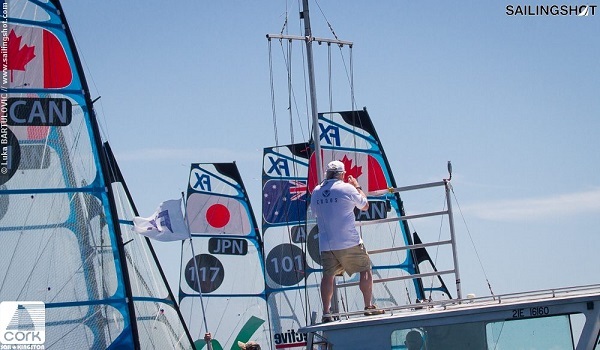 After 4 exciting days the Junior World Championship titles were decided just off the KYC breakwater. 3 exciting medal races in each fleet lasting 6 minutes each! It was a very busy day for the RC and volunteers! KYC was well represented in the 49er FX class by Max Wood, Nate and Cameron Colburn. Ali Ten Hove (KYC) and Mariah Millen (RCYC) placed 5th overall in the FX fleet. They both showed tremendous perseverance and determination especially given the breezy conditions this regatta! 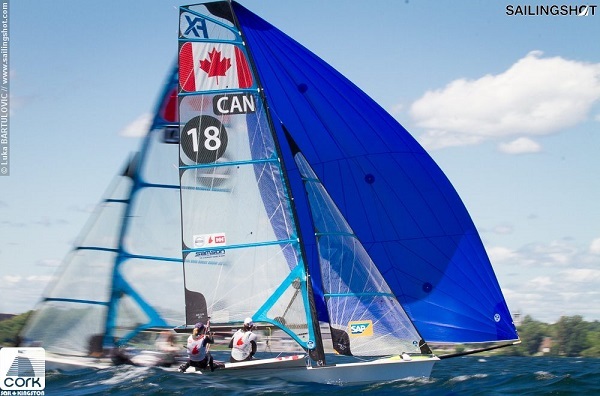 Racing Thurs-Sun with medal races Sun afternoon. 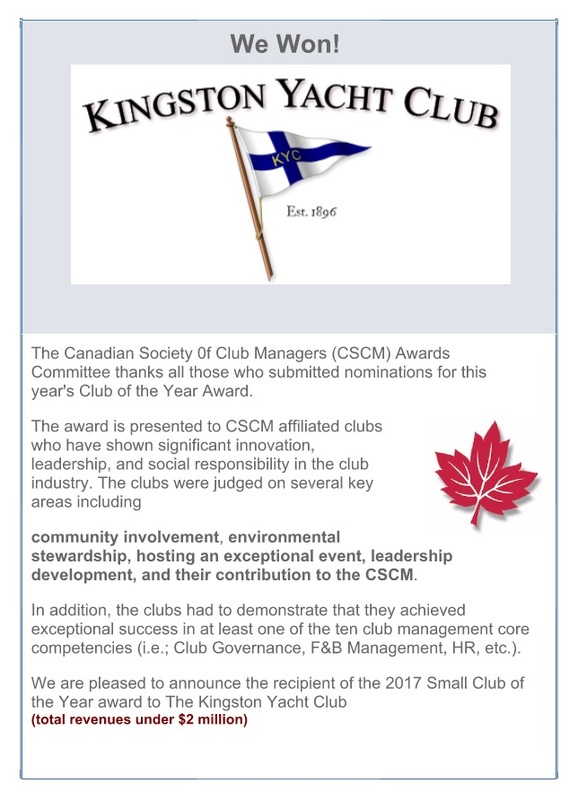 | Small Club of the Year Award!